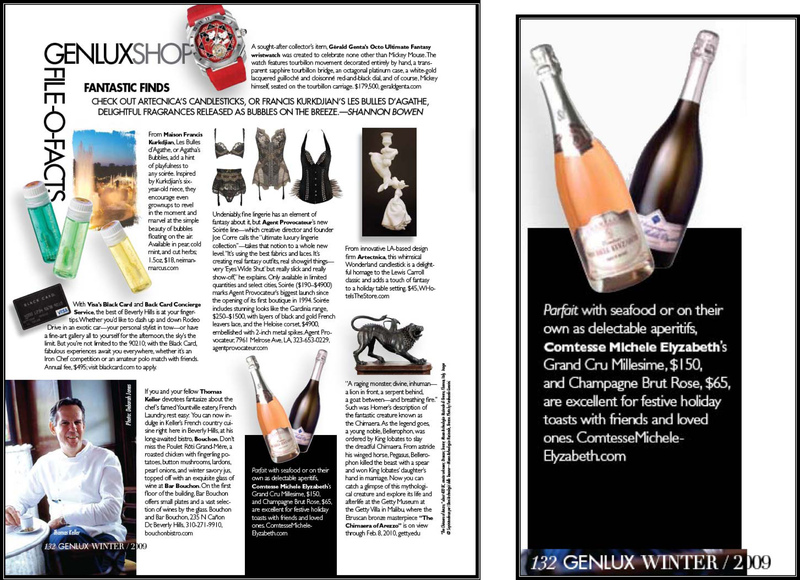 Click here to see our champagne in the past winter issue of GENLUX Magazine! The Tasting Panel enjoyed Comtesse Michele Elyzabeth's Rose while dining at Petrossian in West Hollywood. Click here to read article. The news is buzzing around town about Comtesse Michele Elyzabeth's champagne! Check out the mention of our Grand Cru at Buzz of LA.com. We are happy to welcome Lucques to the exceptional group of restaurants where Comtesse Michele Elyzabeth's champagne is being served! You can also enjoy our champagne at Villa Blanca in Beverly Hills and SUR & Petrossian in West Hollywood. Comtesse Michele Elyzabeth's Brut Rose champagne is recognized yet again in The Tasting Panel Magazine. See article here.